LASEK vs LASIK: What's the Difference? Question: Is LASEK eye surgery the same thing as LASIK eye surgery? How do I know which procedure is best for me? Answer: LASEK and LASIK are two similar vision correction procedures that have important differences. If you have been told that you are not a good candidate for LASIK, you may be happy to learn that LASEK may be beneficial to you. 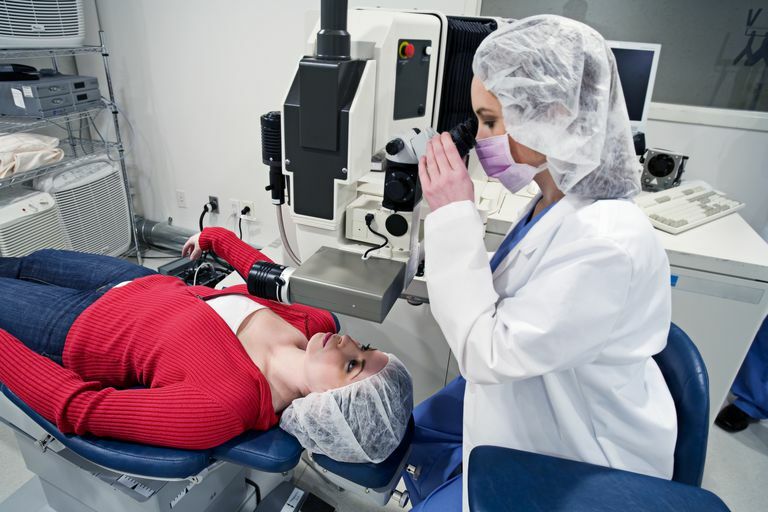 While LASEK and LASIK procedures produce similar results, there are advantages and disadvantages of both. Laser Epithelial Keratomileusis, or LASEK, is a vision correction procedure very similar to LASIK. Much like LASIK, LASEK is used for the correction of nearsightedness, farsightedness, astigmatism and presbyopia. While LASIK uses a laser to reshape your cornea, by cutting deep into the outer layer of the eyeball, LASEK cuts only as deep as the epithelium (the outer layer of the cornea). The first part of a LASEK procedure is very different than a LASIK procedure. During LASIK, a thicker flap of corneal tissue is cut with a microkeratome blade or a different laser. With LASEK, the surgeon makes a fine, shallow cut on the top outer layer of the cornea (epithelial layer). The surgeon applies an alcohol solution for about 30 seconds, which acts to loosen the epithelial layer, enabling it to be lifted and folded to one side. The laser is then applied to the thicker middle layer of the cornea (stroma). The surgeon then gently folds the epithelial layer back down on top of the newly shaped tissue bed. Both LASEK and LASIK are generally safe and effective, but Lasek patients report slightly better long-term results. Although the initial recovery is longer than LASIK, LASEK patients report less postoperative discomfort. There is also a decreased risk of infection and decreased incidence of corneal haze after LASEK. With a LASEK procedure, there is no concern over the possibility of cutting irregular flaps as in LASIK. Some people undergoing Lasek have a faster recovery of nerve sensation in the cornea. Because the corneal nerves play some role in the feedback mechanism that keeps your eyes lubricated, there appears to be less incidence of dry eye, a common complaint after having LASIK surgery. The main disadvantage of LASEK is a slower healing time. Although usually mild, some people seem to experience a bit more pain than those who have undergone LASIK. Most surgeons will also require you to wear a bandage contact lens for the first 4 to 5 days after a LASEK procedure. If your eye doctor has determined that you are not a good candidate for LASIK, LASEK may be a possibility for you. Since LASIK surgery involves cutting deep into the tissue of the cornea, LASEK is a good choice for people with thin, flat or irregularly-shaped corneas. Eye Surgery Education Council, "LASIK." EyeSurgeryEducation.com, 2003.